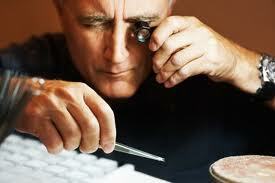 A gemmologist can quickly find out if a diamond is authentic. For ordinary folks, it often becomes difficult to distinguish between a true diamond and a fake one. Read on to know the tips on how to check at home if a diamond is genuine or not. Diamonds are rare while artificial Cubic Zirconium is there to confuse you and cheat your wallet. While the best way to make sure you’re getting authentic diamonds is to shop with reliable online sellers like us, it’s still important to be aware of some basic tips. They come handy! You can place a diamond in the open sunlight and observe how the light reflects through it. The reflection on the inside curves of the stone must be of greyish shade. If the reflection from the diamond carries a rainbow spark, the diamond is almost certainly fake or of low quality. 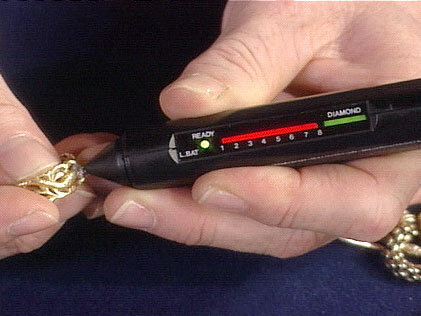 It’s one of the easiest ways to test a diamond without having to avail the services of a professional. However, many people are driven by a misconception. They try to associate this rainbow spark with beauty. The weight of the diamond can also help you to reveal whether it’s authentic or not. The diamond can be weighed on a machine by placing a Cubic Zirconium of the same shape and size against it. The Cubic Zirconium should weigh approximately 55% heavier than the real diamond on the weighing scale. If the diamond weighs equal to the fake Cubic Zirconium then it must be understood that you’ve been cheated at the shop! Go claim your refund! Interestingly, your breath can save your wallet too. Hold the diamond close to your nose or mouth and breathe out directly on it. A real diamond doesn’t let the moisture of breath gather on it. If your breath moistens the diamond for few seconds or more and it turns damp – it is for sure a fake stone. If the diamond is embossed or carved into a metal, check the type of the metal used. Is it real gold, silver or platinum? Or, is it simply gold or silver plated? A real diamond will always be engraved into 14 Karat or 18 Karat gold, silver or platinum. The fake diamonds are usually fitted into gold plated or silver plated jewellery. A keen observation can save you from fooling yourself. Rotate the diamond in your hand and look at it carefully. If it is a real diamond it, will glitter, but a fake Cubic Zirconium will not shine from its inner angles. A real diamond always has the aura of authenticity but a replica will not have the natural edges. A real diamond is always very sharp inside its edges, so it reacts very differently to natural light than an artificial one. The more you play with your diamond, the more it will bare itself to you truly. The best way at home to test a diamond is to test it with your senses. The feel of touch can speak a dozen things about a diamond because there are certain chemical reactions in it that you can notice only when you experiment with it.